In Art this week we looked at the artwork of Eric Carle. The children had the opportunity to share what they observed about his pictures. 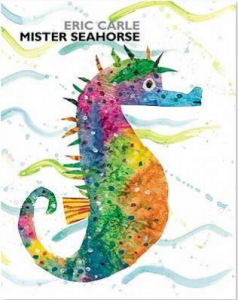 We read Mister Seahorse by Eric Carle. The children discovered how he used paint, tissue paper and collage to create the sea animals in his book. I then demonstrated how to paint the background and how to create the sea horse by filling the shape of the seahorse with various colors of tissue paper. The children were then given the opportunity to create their own seahorses in the style of Eric Carle. Mrs. Yohannan also read Eric Carle’s books in the classroom this week to tie in our theme. This is our last art project of the year. I enjoyed working with your children, and observing their creativity develop over the course of the school year . I hope to see many of you at Art camp this summer!